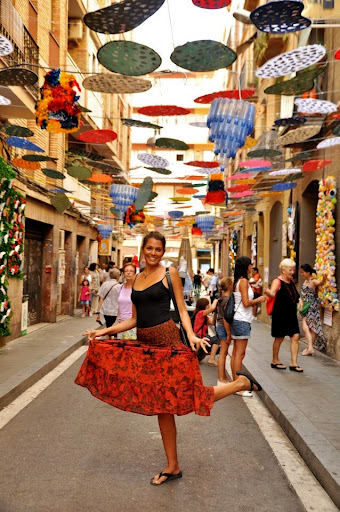 As you may or may not know, Barcelona is split up into a variety of “zones” or “barrios” (e.g. neighborhoods) that locals use to refer to different areas of the city. Some of the more “well-knowns” being Barrio Gotico (the old Gothic section of the city where you can easily lose yourself in-between dreary, dark streets), Barceloneta (where tourists flock to catch some rays on BCN’s never ending beaches), Eixample (where the wealthy spend the day shopping in high-end stores and the evening wining and dining at some of BCN’s finest restaurants). One of the most famed and well-known of Barcelona’s many barrios is Gracia – the Mecca of hippie/bohemian culture where it’s inhabitants, shops and restaurants all share a common value of earth-friendliness and green living. On any given corner of Gracia you will find everything your little bohemian heart desires – organic bakeries and produce markets, eclectic cafes, used bookstores, second-hand clothing shops and yoga/meditation centers. 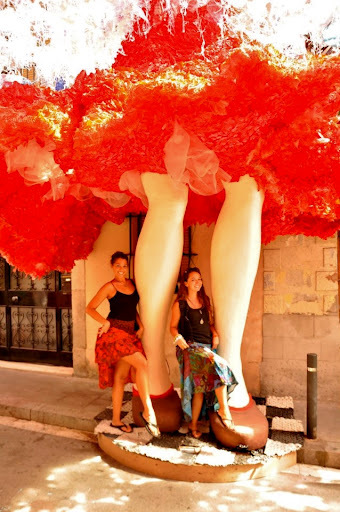 At night Gracia comes alive with an array of pubs and quant bars, live underground music and a mix of cultural restaurants (anywhere from sushi to chicken curry to pupusas). So, you can imagine that when Gracia throws its annual “Festa Major” (Catalan for Grand Festival), it is nothing short of spectacular. 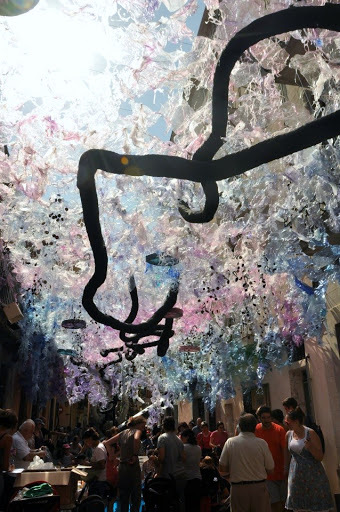 The festival is celebrated every year from the 15-21 of August (yes, the HOTTEST time of the year in BCN) and is a pure collaboration of the residents that live in Gracia. 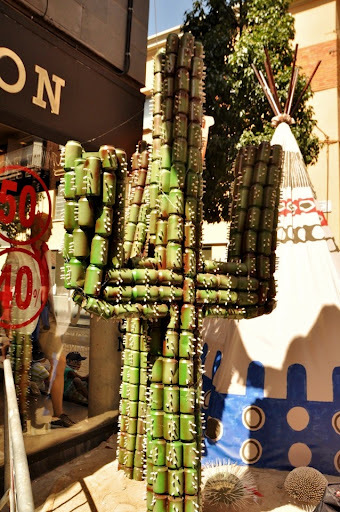 Staying tried and true to both their eco-friendly beliefs and strong Catalan roots, neighbors volunteer to decorate their street following an agreed-upon theme, but with the understanding that they only use recycled items. 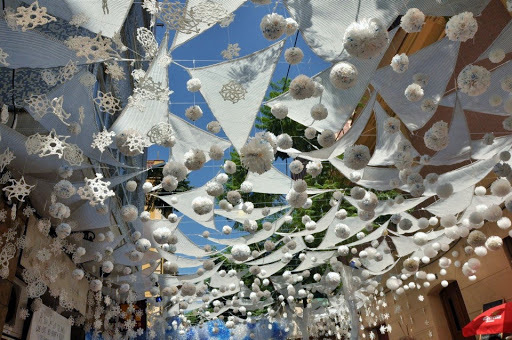 This year 18 streets (and plazas) were decorated (in the past there were more but like everything else in Spain, the economic crisis has even affected “eco-friendly” festivals and thus, many streets did not participate). The themes are voted on during the Christmas holiday and the volunteers spend months preparing the decorations. The themes were both creative and diverse this year, such as, “The South Pole/North Pole,” “The 1920s,” “Star Wars,” “The Wild-Wild West, “Water, “Video Games” etc. In the end, a group of judges (1-2 people from each street) come together and decide on a winner whom receives a certificate, a small trophy and bragging rights for the following year. Festa Major de Gracia is one of the most unique festivals that I have been to this year – the mix between Catalan culture and eco-friendly awareness is one-of-a-kind….a real inconspicuous Barcelona gem that, over the last 196 years, has done well to avoid losing its charm by gaining international popularity.